In the stock market average return is approximately about 12-13% per year. Though markets are not sweet as always they turn bitter as well. It is preferable to invest in stocks for the short-term rather look for long-term investments. It is a myth that people who invest for long-term only get high returns. Earlier there was a trend of blue-chip companies that had a powerful impact on stock markets. People preferred to invest in blue chips companies as feeling blue is goods for stocks. Blue chips companies are meant to be stable. But nowadays in the coming era with the dynamic world changing it is not that much effective to depend simply on blue-chip companies. “Quality has an expiry date” that too perpetually fits for blue chip companies also. Year on year strategies, scenarios, methodologies changes with the technical factors changes. In this cases, investors must follow regulatory checking, portfolio updating. There are several factors that make affect your long-term strategy and may spoil your years of meditation or just we can say we won’t get a worth pay which is nothing to next. While here is the case of your wealth that is connected to your present only. People usually follow buy and holding a strategy. It’s not always bought and hold it’s also bought and review too. Buying itself is not the adequate case and holding does not mean just for the sake of holding. Let us take an example of Rupee and its Value. Purchasing power always goes down in future years in accordance with the inflation rate. A 10 rupee note had a lot of value in our grandfather’s time but today its worth is next to nothing. You had invested 1 lakh rupees 10 years back is not today that much worth due to rupee depreciation. Several other factors recently affecting are the weakness in global cues, trade war issues, rupee depreciation per dollar. 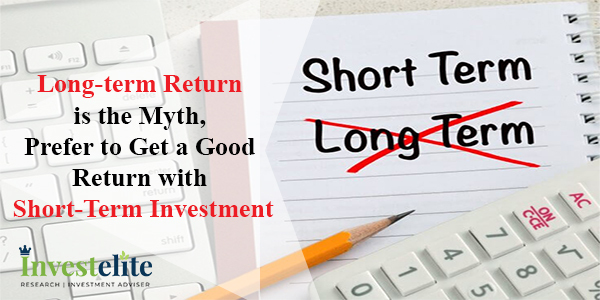 Looking with this all scenarios Our experts of Investelite Research suggests you invest in small term investments like Intraday trading where the positions open and close on the same day. Investelite Research has certified experts that help you to guide about trading tips and why Intraday trading is preferable while investing. We believe to understand the implications of the current result on original investment thesis. Investelite Research suggests you focus on Quality of shares, ratio analysis, P/E ratios, timings of the investments, risk assessments. “Invest with the motive of short-term investment to run a tenure of long-term gains rather than a long-term investment that run with short profit return“.